American artists tend to forget there is a whole world of people outside of the US dealing with the similar esthetic issues - quite effectively I might add. Although New York and Los Angeles may lay claim to the title of major art centers, this may be more a condition of commercial vitality than of intellectual hegemony. The current exhibition of works by Eddy Godeberge testifies to this fact. Godeberge has an intellectual brother in the works of US artist Alan Rath, who has charmed people in years past with his TV screen robots. Godeberge follows a parallel path with his robotic installations. OK this is a patched together cyberpunk robot hacker world not a heavily funded gleaming multinational corporate robotics one. 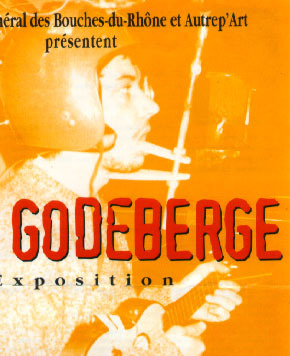 Godeberge tries to find the soul in the machine often times using humor. One very simple piece, a wall work, is a clear plexiglass panel with the outline of hands on it. The panel is mounted off the wall in front of a heating element. One is invited to place ones hands on the spots designated and "get hot" with the machine. The play here is to anthropomorphize machines. Another work has two TV screens on the floor with peoples faces staring up at you in black and white. They are connected by a hydraulic mechanism, that pulls them together and pushes them apart at regular intervals. All the machines in this exhibition, I might add, get stuck or stall at regular intervals, eliciting a human to respond by resetting them. Another work, a steel gauntlet or pergola has a video camera moving back and forth on one track, while directly opposite an out of synch monitor shows the cameras point of view. The camera surveys its space within a fixed tracking motion, occasionally catching a glimpse of a person passing by. A separate darkened room shows a wall projected video of a rather vicious Oriental kick boxing match. There is some air powered mechanism in front of the image which I can't recall. Somehow within all this technology, Godeberge is able to maintain a basic sense of the human concern for contact. Sometimes it is a desire for warmth, or the back and forth of relationships, even the extreme of battery, that defines an essential human quality. Here Godeberge presents a basic dilemma at the end of the 20th century; where do we locate ourselves in the midst of all this machinery? As part of the Cosy Disco performance Cu See Me interface with Port-MIT in Boston, Godeberge did a screamingly hilarious parody performance of a French folk singer. Clad in a football helmet with an armature attached, he lip synched a popular song. The lip synch was rather difficult, given the two pieces of wood clamped in place on his chin and in his mouth. The helmet armature held a simple oil candle close to his pried open mouth. Eddy valiantly tried to sing the candle flame out with his breath, as the crowd cheered him on. Talk about torch singer, this send up was so good Eddy could have a dual career as a walk on for Saturday Night Live. In this instance the human/machine extension prosthesis is as much a handicap as the worn out sentimentality of pop culture. The challenge to the human/machine interaction is to actively question whether the benefits acrrued outweigh any diminished capacity to function as humans. After all we are carbon based life forms. We eat. We sleep. We love. We die. All this while trying to give our lives meaning beyond simple biological function.